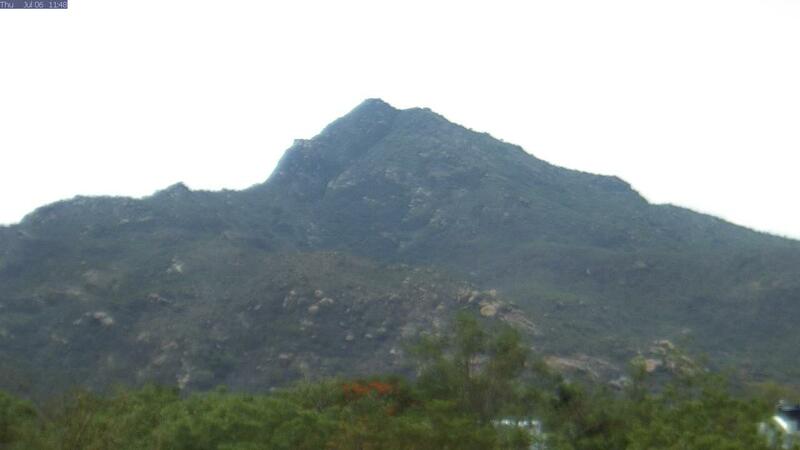 The images are taken from the Western side of Arunachala. They refresh every 60 seconds. Two cameras are used, one with a standard lens for the larger image and one with a telephoto lens for the close view. We use high quality Stardot 5 and 3 megapixel net cameras. Although the resolution is very high for web cameras, atmospheric conditions, lighting and uploaded image size play a major role in determining the clarity of what you see. We are prepared for local power supply failures and have backups in place but Tiruvannamalai is also prone to interruption of the broadband service. The last successfully uploaded image will be shown during these periods. The cameras resume uploading the moment broadband service is restored. When viewing Arunachala from your time zone keep in mind that during the night at Tiruvannamalai, the camera will be switched off and the last image of the day will be shown until the following morning. Timings will be extended during full moon which can often rise directly over Arunachala. Due to the angle of the rising sun in the summer (which can damage the camera sensors), live images will only be available from 8.30am to 6.30pm during the April to September summer season. We will try to include the early sunrise when possible. The daily image archive is a record of the images taken throughout the day. They are arranged in various time periods from sunrise to sunset with emphasis on the the early morning and late afternoon periods . This allows those in time zones far from Arunachala to see the hill at any time period of day according to their choice. ??? Not able to see Arunachala ??? The images use Java script to load into your Browser. If you are not able to see the images you need to download Java VM into your computer.